So what'll it be: Dayton or San Francisco? Alright, so that's not the most common choice for young people getting ready to start their lives. But it's an instructive question. Dayton is the most affordable housing market in the United States, according to Trulia chief economist Jed Kolko, while San Francisco is the least affordable place to live in America. But the San Francisco-San Jose area has a better record of social mobility than just about any region in the country, according to Harvard economist Raj Chetty. In other words, a variety of factors make it the best place for young person to work his or her way into the middle class and beyond. As for Dayton and other Ohio cities, they account for four of the 12 worst cities for that same measure of upward mobility. The Dayton-SF dilemma isn't about Ohio vs. California. It's about a broader dilemma for young workers and, in particular, young couples looking to buy a home, raise children, and achieve the American Dream. 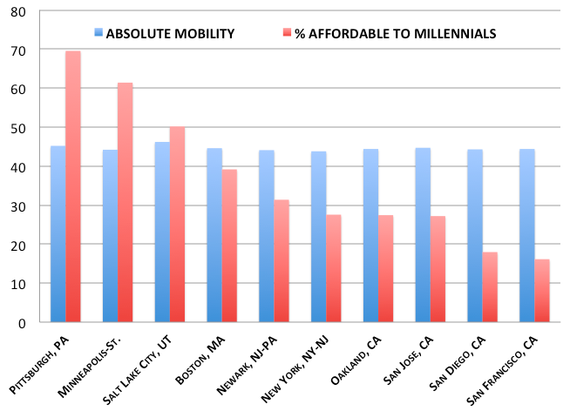 The cities with the least affordable housing often have the best social mobility. 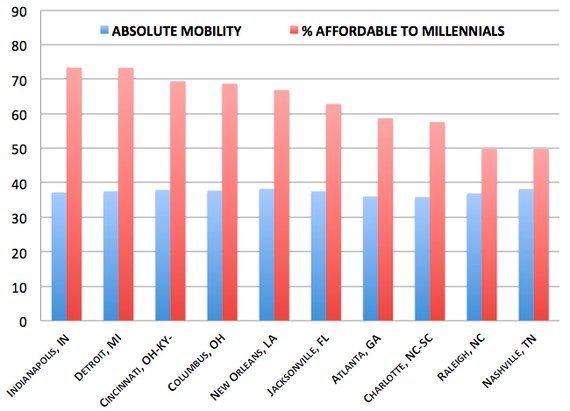 And the cities with the worst social mobility often have the most affordable housing. When good jobs for the middle class and affordable homes are living in different cities, it represents a slow-motion splintering of the American Dream. The American Dream is alive in many cities, like Salt Lake City, Pittsburgh, and San Jose. But it's dying in others, particularly across the southeast and the Rust Belt. In 2013, Chetty and a phalanx of economists produced a one-of-a-kind study on intergenerational mobility—that is, the odds that low-income households can work their way into the middle class and above. Comparing social mobility by metro area, they discovered that the American Dream is alive in many cities, such as Salt Lake City, Pittsburgh, and San Jose. But it's dying in others, particularly across the southeast and the Rust Belt, where cities are spread out, segregated, and blighted by bad schools and broken families. with Kolko's map of affordable housing by city (red is still bad). Climbing the income ladder is easiest in the West and Northeast. But finding an affordable home is easiest in the South and the Great Lakes/Appalachian region. California, home to six of the seven least-affordable housing markets, has four of the 11 best cities for upward mobility. If you plot the 50 largest metro areas by Kolko's affordability metric and Chetty's absolute mobility metric, the inverse relationship is unavoidably clear. 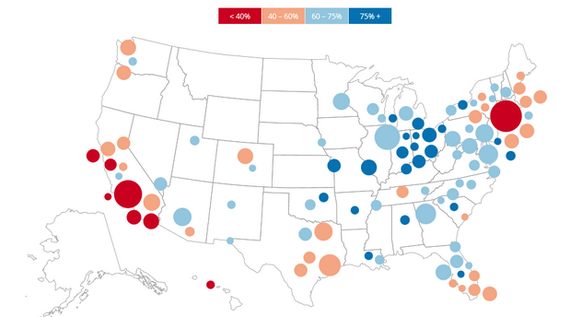 Upwardly mobile cities have more expensive homes. There are the only three cities in the United States with (a) at least 50 percent of houses affordable to middle-class Millennials and (b) a top-10 finish in Chetty's mobility calculations. These are the outliers: Pittsburgh, Minneapolis, and Salt Lake City. 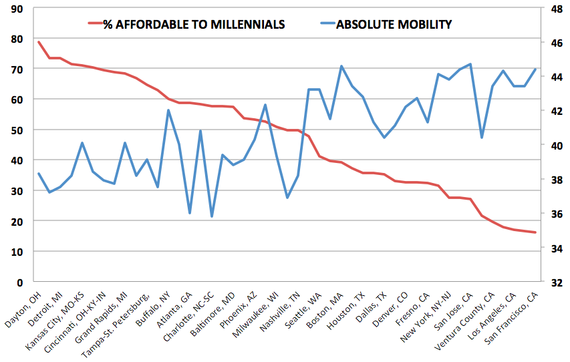 In the graph below, I've isolated the 10 best cities for upward mobility and arranged them by affordability to give you a sense of how steep the drop-off is after our trio of outliers. Less than half of all homes are affordable to middle-class Millennials in Boston, NYC, and across California's major metros, all of which are sterling cities for working your way into and past the middle class. Lots of graphs, lots of colors, but this is a pretty simple conclusion. The American Dream begins with a good job and place to live that you can afford. But today, those two halves of the American Dream are living apart. The good jobs and high wages are in unaffordable cities. The affordable homes cluster in the cities with lower wages and less upwardly mobile families. High-income households bid up home prices, and high prices push out lower-income households. In addition, higher-income metros tend to have less new construction than lower-income metros do. As a result, high-income metros such as San Francisco and San Jose are among the least affordable, even after taking income into account ... Bucking the trend are Washington, D.C., and the Bethesda metro next door, where incomes are high and more than 60% of homes are within reach of the middle class. Until more rich coastal cities find ways match the income growth of their residents with more housing development, the best advice for young people seeking the American Dream isn't "Go West, young man" or "Go East, young woman." It's "Check out Pittsburgh, Minneapolis, and Salt Lake City." *Kolko calls a house affordable when "total monthly payment, including mortgage, insurance, and property taxes, is less than 31 percent of the metro area’s median household income" for Millennial-headed households. Millennials is defined as adults under 35.